I could really use the card this month! Somtimes I wonder if I have luck at all. I’d love to win this card! Thanks for your giveaways and your site! I’m following you on Facebook! Thanks! New to couponing at Target, but I’m really loving it!! Thanks for the giveaway! i would soooo love to win this! Love to win this cute card! thanks for the giveaway, id love to win this! Love those gift cards. Thanks for the chance. Need some diapers for my twin boys!! Thanks again!! As always, thank you for this chance at your generous giveaway! I ‘like’ totally target on Facebook! Thanks for this chance. the cutest giftcard ive ever seen! I’d love to win. Thanks for the chance. Yay! Thanks for the awesome giveaway. 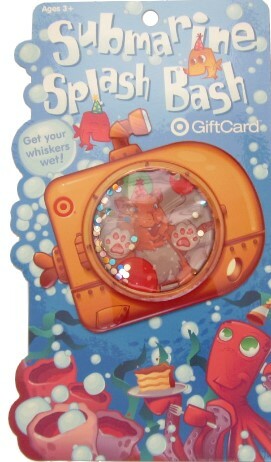 love that splash bash gift card! too cute! Love your website! Saves my family lots of green!!! Adorable gift card! You rock! I would love to win this…thanks for the opportunity! Love your website and match ups! I tell all my friends!! Hoping to win this week!